We’ll we are back from Disneyland. It was such a wonderful feeling to un-plug and spend 100% quality time with my family. I can’t say enough how important that is. My family is SO wonderful. We “obviously” had an amazing time. It’s Disney… need I say more? 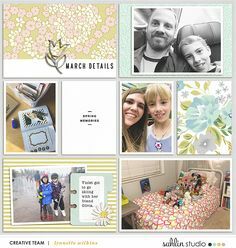 Now that I’m home, I am SO excited to document our week!! I thought I would do a “Trip Report” of sorts for a number of reasons #1 Documentation: While I have plenty of photos, notes, trip ephemera… I want to get my thoughts written down to help remember it later on. So I apologize if it gets a little lengthy! 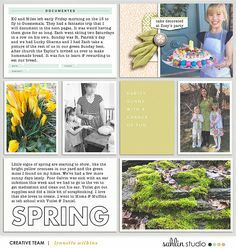 #2 To Share with Friends and Fans: I love reading about friends trips, learning what they liked, didn’t like, where they ate, etc. So you can have an idea of what we did while we were there. We left Minnesota knowing that a huge storm was on it’s way… AND, if you didn’t know… people that live “up in the northern states” relish in the fact when it snows 14-20 inches and you are enjoying sunny 75degree weather. It made our trip even better. (insert my evil laugh) We arrived in Anaheim early. When does this happen that you arrive at your destination early? 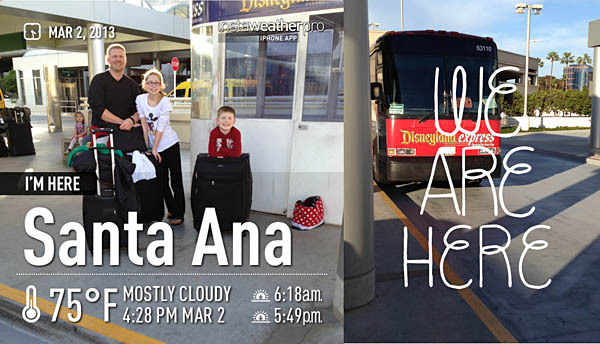 We grabbed our luggage in no time and rushed to find our Disneyland Magical Express. This is where our trip didn’t begin so magical. We found out that the Disneyland Express only comes on the hour. It was 4:03. So we have to wait an entire hour? Uggg… are you kidding me?? So much for arriving early. NOTE for anyone traveling to Disneyland: Taxi’s at the John Wayne Airport to the Disneyland Hotel is the EXACT same price that we paid for the Disneyland Express. Plus you can leave immediately after your flight. No wait time. I will definitely be doing this next time. Not to harp more on the Disneyland Express, but it is not the “magical” way to go. The driver was the least “Disney” person you could have imagined. He complained the whole way about his childhood, how he can’t afford to go to Disneyland because he has to pay child support, and literally was screaming ranting on the bus. There were MANY children on board, so this didn’t sit well with me. I had to remind him not once, but two times that we had children on board… and to please keep it clean. Whew. (I found out later at the hotel that Disney hires out their Disneyland Express. But I think they would be horrified to realize what they stamped their Disney name on. 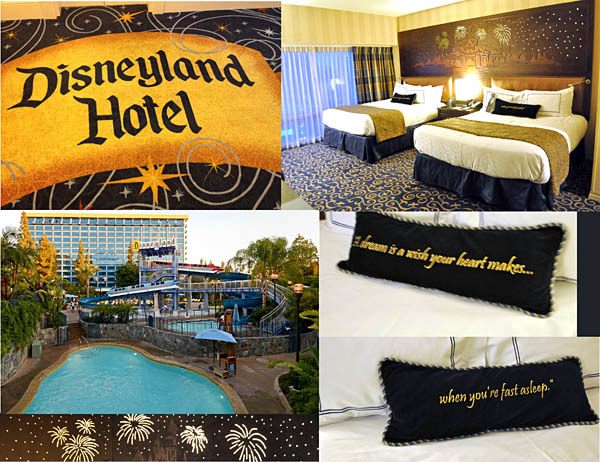 Since this was our first time to Disney”land”, we decided to splurge and stay at a Disney hotel. I wanted to stay in the “magic” bubble of Disney as long as I possible could. Once we arrived at the Disneyland Hotel were just so pleased. The hotel was beautiful! Right from the start we noticed how clean and gleaming everything was. I loved the Mickey and Minnie bronze statues out front, and the Mickey and Minnie topiary’s we saw heading to our room. My kids promptly HAD to take pictures with each one of them. (Yes, I’ve trained them well). Our room was located in the Frontier Tower Building, which is one of three towers at the Disneyland Hotel. As we walked into our building, I thought it felt much more like a “condo” building than a “hotel” lobby. Perhaps it was because the lobby area was an empty floor with just a few seating areas, but no staff or front desk in this building. But there was a miniature model of the Big Thunder Railroad in the lobby. It was pretty awesome, I could’ve looked at the details of it for awhile, but we were anxious to get to the room. Once we got to our floor I noticed what Disney is so known for, “theme”ing. The carpets were amazing right out of the elevator, (with the emblem of the “Disneyland Hotel” and swirled versions of Mickey ears”). I already KNEW that we’d be blown away by the room… and we were. There was an ENTIRE wall of windows with the most incredible view of the Disneyland Hotel monorail pool. The beds looked SO soft and inviting, I want to snuggle right in. And the best thing?? Above the beds there was the most beautiful wood carved headboard of the castle, at the flick of a switch the elements lit up and played the tune, “A Dream is a Wish Your Heart Makes…When Your Fast Alseep “. I have to admit we got SO much use out of this fun feature. We played it a few dozen times every morning when we woke up… AND again when we went to bed. The twinkle lights on the headboard made for an awesome “nightlight” for the kids at night too. After all I had read about Trader Sam’s I thought this would be PERFECT for our first night. I knew it would be late, and after a day of traveling my husband and I would love a drink. This place was SO cool. There were dozens of lit tiki lights outside, and you could hear the Hawaiian Music well before you made your way up to the restaurant. Walking into the bar, I wanted to absorb all of the amazing details. It was very much like the que of the “Jungle Cruise” ride… but even better because I knew that we would get food!! LOL! My kiddos ordered the Schweitzer Falls, which was like a kicked up freshly squeezed juice “kiddie cocktail”. (AND, it came with an umbrella and slice of pineapple on the side). I will never forget what Gabe said when he saw his drink and took a sip. “Ahhhhhh… this is the Life. Right, Mama?” “Absolutely buddy, this IS the Life! !” He made my heart just smile. I ordered the Tiki Tiki Tiki Tiki Tiki Rum drink. It was so good, but different than I expected. It was almost like you were drinking something like “rice pudding”. It was creamy, with cinnamon and nutmeg, and a hint of a pineapple. 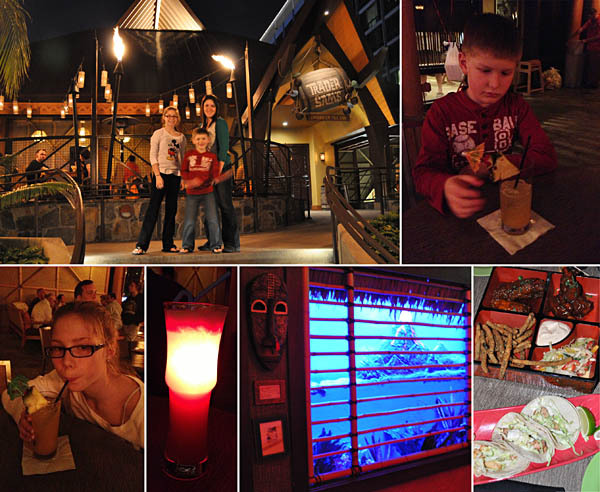 Aaron, my husband, ordered the Krakatoa Punch (at my insistence), and a few fun things happened after he ordered it. There was a STORM that blew threw the inside of the bar area, the lights dimmed and “windows” had lightening and rain. So it was a fun little show for the kids. PLUS, when he got his drink it had LIGHTED ice cubes in it, MUCH to my kids delight. It was a pineapple type drink, but had ALOT of alcohol in it. After we ordered we took our drinks outside onto the patio to listen to the musicians and eat. We ordered: Pu Pu Platter – This was a combination appetizer plate and had something like Sweet and Sour Wings & Ribs, Fried Green Beans and a Coleslaw. I thought it was good and had interesting flavor combinations, but I don’t know if I would order it again. The Wings were the one thing that went right away and the kids loved those! Fish Tacos – I can’t help myself, I love fish tacos and ordered them whenever I see them on a menu. These were wonderful and I would absolutely get them again. Kalua Pork Flatbread – This was the most “normal” of the foods we tried, and the kids gobbled up what was pretty much like a BBQ Pork Flatbread. By this time it was pretty late. Back home it was about 9:30pm, and my kids usually go to bed around 7:30pm… so they were looking pretty pooped. But I wanted them to acclimate to the time a bit… so we headed to Downtown Disney to pick out our lanyards and pins. On our last couple trips we’ve booked with AAA, and I can’t say enough wonderful things about them. They always include the coolest perks or little “extras” just for booking with them. This time, we got vouchers for FREE Disney lanyards and an exclusive Disney pin. We went to the Pin Trading booth in Downtown Disney and found out the the 2013 AAA Lanyard was a black lanyard with Lightening McQueen stamped on, it also had a pouch on it perfect for storing your “Key to the Magic” cards or FastPasses. Also, we received the 2013 AAA Pin, which was a Disneyland Carsland pin that had “Mater” on it. They both were SO cool and my kids were SO excited… they would have spent all of their ‘spending money’ that night on pins if we would have let them. After this we headed back to the hotel for some shut-eye. It was only 8:30 PST (10:30 back home) but we were so tired. YES, I did feel like a weenie. We found out that waking up early was pretty easy (our internal clock were still 2 hours ahead on Minnesota time). So, on our first day we were up and at ’em at 5AM PST. I found it was the perfect time to chat with the family about our prior evening… About things like what we liked about our hotel, the pool and about Traders Sam’s (where we ate at the previous evening). It was also a great time to give what the plan for the day was. This is when Sophie noticed that “Mickey” stopped by our room and left a note and a few small gifts. It is an understatement to mention that they were excited! They were hopping around the room when they saw Mickey left them a few pins for them to trade today in the park. They really got into pin trading on this trip. Anyone that knows me knows that I am a planner. No matter where we go, I always have a plan, a schedule, a map and know exactly what is going on at all times. Well… this trip, I learned to throw that out the window a bit when “the plan” didn’t go according to plan on the first morning. OR maybe it was just “California” telling me to chill’lax a little. We arrived at the Disneyland Park gates at 6:35am to get in for the Extra Magic Hours (which is for hotel guests)at 7am. We waited for them to open, and got so excited, when we got up to the gate and “WE COULDN’T get in”…. so I realized on DAY 1, what one of the biggest differences between Disney World and Disneyland. (I’ll probably mention this a few times as I go on in my trip report.) I found how Disneyland’s hours operate pretty confusing. They open at a different time EVERY day, (on Sunday’s it 8am, Monday is 9am, Tues-Thursday 10am, Friday 9am). GAH! It was hard to remember. But not only this, but the parks have Magic Mornings AND Extra Magic Mornings on different days as well. Is it just me or does everone realize that they have TWO different special morning hours? Don’t the title of these mornings not sound the same? Well we went to the park for our Extra Magic Morning was told it wasn’t today, that it was Magic Morning. Ummm…. OK. Apparently, Magic Mornings as ONLY for Annual Passholders. Huh? Seriously, did I not spend months surfing the internet boards and touringplan.com and not know about this? So I mentally re-grouped and figured out the Disney’s California Adventure Park had the Extra Magic Morning on this day. (If you weren’t confused just by reading this, you are frickin’ brilliant!) On with the show. Since I needed to stop right away and get our PhotoPass Plus Card, I figured we would do that at the DCA park and come back. By the time I finished up with our PhotoPass+, the Disneyland Park was now open and we headed back over there. This is when I realized HOW COOL Disneyland was!! Seriously, within a matter of 5minutes, I could walk from park to park. It is SO awesome to have both of the parks so convenient to each other. I LOVE this. No need to hop on a bus or plan your WHOLE day for one park. So easy!! We are here! I love the moment where you are strolling down Main Street. (It give me chills just thinking about it). But, when we got to the end of Main Street I saw that the park wasn’t fully opened yet. I was a little confused at first, but figured out that they open the park a bit early, but don’t let you into the lands until the “official” opening time. I figured we could just grab a bench and people watch for a little while, when…. a cast member walked up to us. 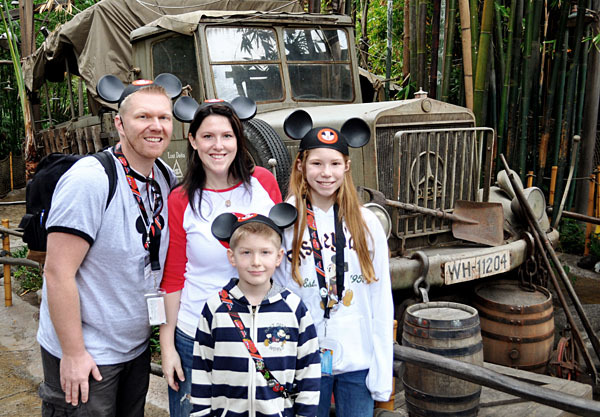 I can imagine what my family looked like… A mom, dad and 2 kids all wearing their Mickey Ears and matching T-Shirts just screamed, “I’m READY for Disney magic”!! Well a cast member walked up to us and asked if we’d like to go into the park before it opens and ride on Indiana Jones. EEK!!! “Why yes sir, where do we go!” Tony, introduced himself and told us to follow him. He took us passed the rope, into Adventureland (and I turned my head to see everyone standing at the rope gates staring at us.) Yeah, I felt like we were celebrities. Seriously… WAY cool!! Then Tony lead us to the Indiana Jones entrance and started telling us so many cool fun facts about the artifacts and pointed out several that were in the wait line areas. He gave Gabe a decoder sheet and had him decode some of the markings, and he explained some of the legends. It was pretty neat to hear all of his knowledge. Then he walked us right onto the ride and took our family photo in the jeep vehicle. I just thought such a small thing could make a family so happy. We got off the ride, and he had a certificate with our name on it saying we were, “Honorary Archeologist”. I wanted to get a photo with Tony, so another cast member was nice enough to take that of us. Lastly, he gave the family fastpasses for 2 rides that we wanted to do today. Again, magical. After our Indiana Jones Magical Experience we went right to our breakfast reservations at Plaza Inn, “Minnie’s Breakfast in the Park”. They took our family portrait outside, and for the first time SO glad I have the PhotoPass+!! Now I’m able to get in a few family photos on this trip. The Plaza Inn is a buffet styled meal, and I couldn’t believe the large selection of food! From fresh fruit to made to order omlets and Mickey waffles, to standard breakfast fare of eggs & bacon. Once we got our food and went to sit down… I was faced with the one thing I don’t like about buffet/character meals. While I LOVE meeting the characters, it is such a bummer to get bombarded before you even sit down or get your tray on the table. Literally, we had 3 characters waiting at our table before we sat down. I was so busy trying to arrange our food onto the super small table, I feel like we all really missed out on some good interaction time with the characters. We were there more so to meet the characters vs. the eating part of it… but I was pleasantly surprised that the food was really good. There was SO much selection to chose from! I think it was one of the best omelets I’ve ever eaten (my hubbie sitting behind me echos this as well)!! I really like The Plaza Inn, my only small gripe would be that the characters seemed to rush through. Like they only had enough time to sign the autograph card, quick pose, and barely say good-bye before hurrying off to another table… which is sort of disappointing given the steep price we paid for the experience. All in all, I would do this restaurant again… but would probably chose a hotel character dining experience at a time BEFORE the park opens to make better use of our “park time”. After breakfast, we just had enough time to do the Carousel and Dumbo before our tour. Since this was the first time we had been to Disneyland, I thought the perfect introduction to the park would be to take the “Welcome to the Disneyland Resort” tour. This tour was a 2 1/2hour guided tour of both the Disneyland Park and Disney California Adventure. I knew we would do a few attractions on the tour and receive priority seating for an event when we were done, and I thought it sounded great! We met with our tour guide for the morning at the Tour Desk (which is right in the entrance of the Disneyland park). Right away, we were asked if we wanted “dining reservations” for the evening (out of a list of 4 or 5 options), and was also asked what show time wanted Priority Seating for “Aladdin”. I mentioned that we weren’t planning on doing DCA that day, and asked if it was it possible to make it for the following day. I was pleased that they were happy to make our priority seating for the next day. After this was done, we began our tour. I noticed right away that our tour guide seemed quite nervous, she seemed overwhelmed and got tripped up on her words quite a bit. My heart went out to her a bit, but I’d be lying if I didn’t say I was a bit disappointed like she was basically reading a brochure or a script to us on the tour. It was such a canned speech and she didn’t input any other fun tidbits, information or personality to make the experience. The tour cost about $20/pp (w AAA discount) which was a total of $100 for a tour for 4 people, so I had wished we had gotten a little more information. Overall, I’m glad we did the tour. We got a basic idea of the parks layouts, went to a couple of different attractions (A Bug’s Life at DCA, and Pirates of the Caribbean & the train at the Disneyland Park). I thought it was a HUGE perk to get the “priority seating” tickets to see “Aladdin”. All and all great experience! I was SO tempted by all of the goodies in the bakery case that it took me awhile to remember to look around at the details. I loved the items they displayed inside the Jolly Holiday. It was practically perfect!! This is a quick counter service restaurant and everything from ordering to finding a seat outside on their patio went smoothly. Here we tried: Toasted Cheese Sandwich with Tomato Basil Soup – was sooooo good!! The perfect grilled cheese sandwich, and the tomato soup was heavenly creamy. DEFINITELY getting again! Hot Angus Roast Beef on Toasted Onion Roll – I wanted to like… but it was just “eh”. I was disappointed that it didn’t have much flavor, but the chips were yummy. Seasonal Cupcake: Chocolate Mousse Cupcake with Raspberries – I die. There are NO words to how yummy this cupcake is. You can’t even really call it a cupcake, it has so much going on. Once you cut into it there is the most perfect chocolate mouse inside and hidden raspberries. (We had this a couple times on our trip!!) Matterhorn Maroon – Also another item we got a few times on our trip. Only Sophie and I like coconut (which is A-OK with me… becuase it left more for me) But these macaroons are so yummy! After we had our great lunch at Jolly Holiday, we were ready for our day at Disneyland. This was when we realized even more how lucky we were to receive those open Fastpasses earlier in the day from “Tony” (see Magical Moment #1) We spent the afternoon hitting a few of the main attractions: Space Mountain, Autotopia, Star Tours, Buss Lightyear, Astro Orbitor and the Tea Cups. Those fastpasses were SO awesome because we literally got to WALK ON a couple of ride that had 45 minute waits. Another thing that became a fast obsession was: PIN-TRADING. The kids had a blast and were constantly begging to find people to pin trade with. I also got involved in it with them (but I didn’t do any trading or anything), it was so much fun just helping them find cast member to trade with!! *** NOTE: The jackpot of all places to trade, was at the pin trading store in Frontierland. This place had SO many pins for trading!! We stopped here a few times during the week. Cafe Orleans, was one of the restaurants that I was most looking forward to on the trip. We had an advanced dining reservation and got seated inside (by our choice, it was pretty chilly outside this evening). 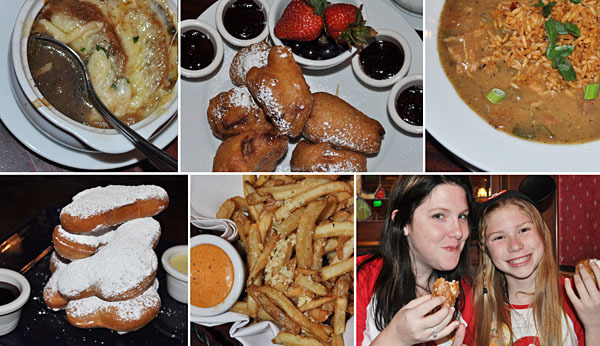 We ordered: French Onion Soup, New Orleans Gumbo, Pommes Frites, Monte Cristo Sandwich and the “Mickey” shaped Beignets. Oh my goodness, everything we ate was fantastic!! Sophie had to order another bowl of the french onion soup, Gabe said the gumbo was the best soup he’s ever had… and when we got the Monte Cristo Sandwich, I have never seen two kid attack a plate that fast. Gabe kept muchin and said, “This is an awesome dessert.” HAHA!! I chuckled and told him this was our supper sandwich, and his eyes just popped open. After this our Mickey Beignets came. That raspberry sauce is so yummy!! Sophie literally licked out each of the containers. We were SO tired by about 8pm. I had figured that we walked about 13miles today!! Oof! My feet were sure feeling it. (I made the mistake of wearing flip-flops today. BAD!!) I was ready to sit down with the kids and claim my fireworks spot. We had about 1 1/2hr to wait. Oh boy. I was nervous about this becuase I didn’t know if my Gabe-y could make it. My kids regularly go to bed about 7:30 our time, and Gabe is usually the one to tell me he is tired and ready for bed. Well, I laid our Mickey blanket out on the ground, and he passed out. Sweet tired boy. Sophie and I chatted, while daddy went off to get us some treats!! It wasn’t a Disney day without a Churro and Sweet Cream Cheese filled pretzel. Those are so yummy. And we waited… waited… waited… finally we had 5 minutes to go and the loud speaker said, “Attention: Due to wind conditions the fireworks spectacular may be cancelled.” DOH! NO!!! Please don’t’ tell me we’ve sat here 1 1/2hours and the firework show would be cancelled. After waiting 15 more minutes, management had decided to go on with the show. YAY!!! One of my ALL-TIME favorite thing at Disney to do is to see the firework show. I don’t know why… but it always makes me an emotional mess. I have tears steaming down my face and hug my kids tight, because I’m so happy. The “Remember… Dreams Come True” Fireworks Spectacular at Disneyland was a great show. They did an awesome job at story-telling where they went through a few of the classic Disney movies and characters, as well as our favorite, “Pirates of the Caribbean” The fire being blown up and the music for the Pirates scene was seriously COOL!!! It sure got your heart going. Also, I couldn’t believe how different “Tinkerbell” here at Disneyland compare to the show at Disney World Magic Kingdom. At Disney World, Tink makes just one trip from the castle to Tomorrowland. But here at Disneyland she literally swooped over the castle (just like in the Disney movie intros) and kept flying over and over again and again… it was pretty incredible and Aaron & I both LOVED that. Perfect ending to a wonderful day! I’ll be back soon with the other days of our trip. Thanks for stopping by and reading! Good times, good times…. Reading and seeing the pictures is awesome, helps me remember all the special details of our trip. 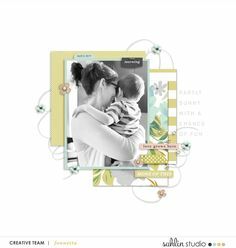 Wonderful family memories were created and now captured! I LOVE reading trip reports! Thanks for sharing all the details! I agree with the fireworks – they are my absolute favorite part of Disney and getting emotional must be a mom thing? I get teary every time I watch them, too! Loved reading this post – can’t wait to read the rest of your trip. I’m planning a trip their in Sept. What is PhotoPass+?? How much does it cost and how does it work? I have said it before but I think we must be kindred spirits! We’re planning our first trip to DL in a couple of months and I’m busy making lists, schedules, notes, etc. You’ve already mentioned several things I’ve picked out to try, restaurants and even which menu items! You certainly have a great attitude about the items that were less than magical (the bus trip sounds awful, I really love WDW’s ME and it’s a shame DL doesn’t have it too). Great trip report so far, I can’t wait to read more and especially see your layouts! We went to Disneyland for the first time about a week or so before you. We also stayed at the Disneyland hotel. And while we had a GREAT time, we’ve talked a lot about a “Do Over” because of what we learned on that trip – thinking we could do it much better now. After reading your first day report, I’m SERIOUSLY wanting a do over! PS. 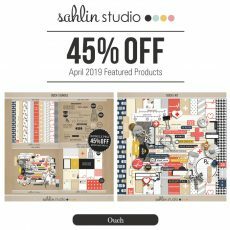 – Thanks for the mouse scrapbooking supplies! We discovered them shortly before we left and can’t WAIT till they all come out. We’ve put the ones you’ve published to good use already! Let’s see… on these days, I got my son and daughters sweatshirts, and dughter’s traveling shirt I got from the Disneystore.com. On Day one I got our matching-ish family shirts from an Etsy store. Boy’s here: https://www.etsy.com/listing/83310136/new-mickey-head-applique-initial?ref=shop_home_active Girls here: https://www.etsy.com/listing/97315998/new-minnie-vacation-personalized-custom?ref=shop_home_active Otherwise, I am lucky to find different shirts at Target and Walmart on occasion. So much fun to read your first day adventures…well, except for the not-so- Magical Bus! We use this at WDW every time—it is free for us (???) and it is wonderful. I would have definitely reported your bus driver….terrible intro to Disney and he shouldn’t be driving for them! Looks like you did so much on your first day! 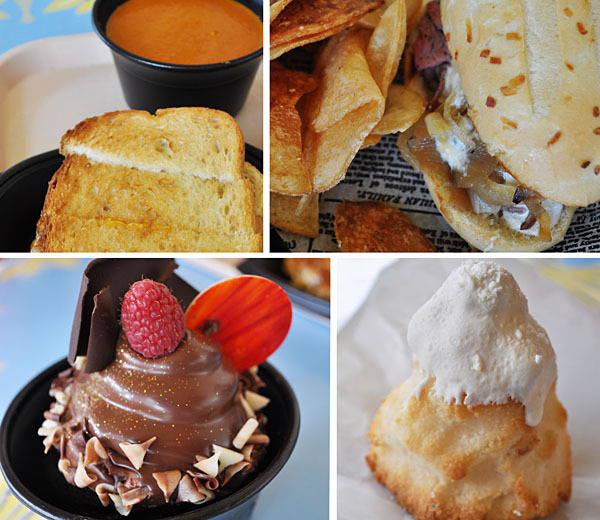 The food looks yummy, and I hope they have the same yummies in WDW when we arrive there this month!!!! Can’t wait! We are DVC members, so we go often….and we have learned through trial and error to try to go with the flow and just have fun! Each visit is always different! Wish our Disney store didn’t close…would love to get cute shirts before we go! It really makes your photos perfect! Can’t wait to read more on your trip! Thanks for sharing! Love your report! Have you posted other days of your trip? 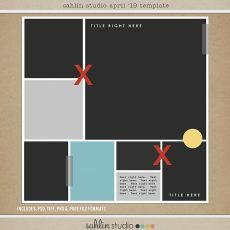 I am planning and love your ideas! I’m a project mouse scrapper and using your kits on our wdw trip from last year. Thanks!